Thanks to the dedication and hard work of our veterinarians, staff, and volunteers, PFA has broken through barriers and increased our surgical capacity by leaps and bounds. 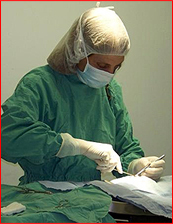 For the first time ever in the history of PFA, we performed over 1,000 surgeries in December 2008. Since then, we have sustained that level of performance every month. We expect to complete nearly 12,000 surgeries this year. Saving more lives than ever before!